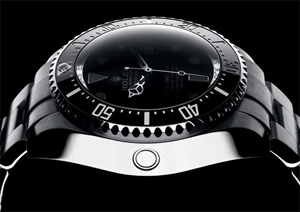 Rolex Sea-Dweller DeepSea, 116660, WR 3900 m Part 2.Black and incorporates maxidial needles and larger indexes. Black and incorporates maxidial needles and larger indexes. It’s very good reading, hands and indexes are white gold. Calendar at three quick adjustment without magnification in the crystal. The night light is very accomplished and is blue, here you can see compared to a master ceramic bezel GMT. Located inside the clock case middle, between the glass and the bottom of the box, the ring of high strength stainless steel with nitrogen injected alone supports the pressure exerted by the water on the glass and the bottom of the box. The case middle is also made of 904L steel, the inside of the ring is engraved with ROLEX … and 6 is the serial number. It is important to have on hand and see the serial number of the watch without having to remove the bracelet as in previous models. ‘s manufactured by Rolex and brings the legendary caliber 3135 with 31 rubies, and equipped with the new blue spiral Parachrom is an innovative alloy resistant to shocks and magnetic fields. The exhaust is provided with an anchor wheel made of paramagnetic material, the manual-winding movement and supports have second stop. The power reserve is 48 hours. Caliber is Swiss chronometer is rigorously tested and is adjusted in five positions and subjected to three different temperatures with consequent COSC certificate. This picture does not correspond to a DeepSea, but if it’s caliber 3135 without the new spiral, sorry, I have no more. The steering wheel adjustment screws or counterweights on the inside, Rolex calls it “microestela nuts”, so to be on the inside is slightly reduced aerodynamic turbulence created by these screws when the “heart” beats more alternacias of 28,000 hours. An enlarged detail of the new coil. THE PRICE in August 2008 is 6880 euros. Always say that comparisons are odious and that is a little truth here: this watch compared to a normal or classic clock looks great. Sure, they’re 43mm vs 40 and it has to be noticed. Beside a super classic, the Submariner Date, the DeepSea excels in all aspects. Here, everything changes, these watches are not comparable in quality and finish but in size. The DeepSea here no longer stands out as the previous picture, as his “rival” is the new 44mm Seiko Sumo, and is that a diver of this size today is not an exaggeration. The ratio between the box and the Seiko bracelet is even more pronounced because the Japanese bracelet is 20mm instead of 21mm the Rolex, I think a bracelet wider prominence remove the clock and not bring nothing but more weight the whole. Conclusion, is a watch that I liked it. 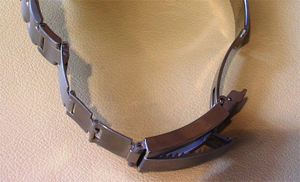 There is a watch suitable for continued use as the weight and especially the thickness make it more “uncomfortable”. The 43mm size I see it, especially when this watch is only a substitute for Sea-Dweller, a watch that was never a super sales and spent his 36 year history in the market rather “hidden” and only known by fans to the brand. The DeepSea at birth has created a buzz without limits, a watch desired by some and criticized by others, in all forums has been ported. I if I see a watch with 100% DNA Rolex but technical improvements important, a great match for the competition in luxury mechanical watches. Rolex, a pioneer in diving watches could not have in their catalog a Diver WR 1200 meters as a top model, we are in the XXI century and the barrier of 1000 meters has been comfortably surpassed by many brands, and simply as “pride “I had to have a clock” superior “to the competition. Rolex does not want to miss the opportunity provided the market with the new measures and trends in addressing an audience that did not want Rolex for their size or what they passed on their previous models in hand. Rolex market remains classical models: Submariner, Submariner Date, the LV, and gold versions or mixed, and has also released a new Submariner with ceramic bezel, maxidial, and with the closing of DeepSea although currently only manufactured in precious metals, but always keep their 40mm. So not happy is because they want to, because you want what you can find large and normal as you want … remains the same in all other models. A photo bare arm. Definitely a watch that has marked a new era in Rolex, and this time … has set the bar very high.